"A riotous comedy cabaret for all ages, shapes and sizes. 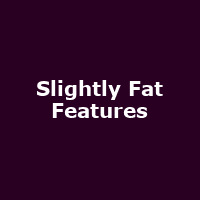 The smash hit variety troupe Slightly Fat Features, cavort into London with their astonishing physical skills and orchestrated mayhem. A variety gang show for the 21st century. Audience favourites across the World, including at Just For Laughs in Montreal and Edinburgh Fringe where they were picked as The Times top comedy show. As seen and heard on the BBC- come see why this leading British variety ensemble have been described as part Monty Python part Cirque du Soleil."